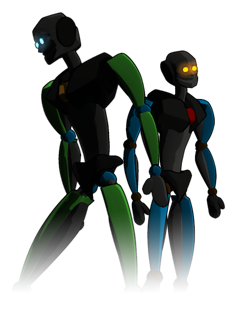 Now we are going to start to rig just one leg here and then eventually we will let A:M do the rest of the work for us by automatically rigging the other leg. 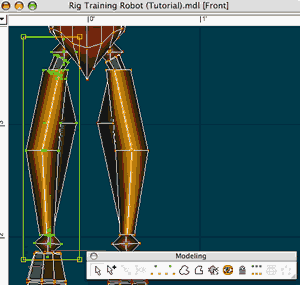 We are going to start by rigging the model’s right leg starting at the thigh. If we want to we can assign the mesh to the thigh bone that we will create much like we did with the hips. This thigh is made up of five different mesh segments so I want to show you another approach that you can use whenever you find it practical. We may recall from our initial examination of this model that the mesh is grouped into segments. One of those grouped segments is for the right thigh and it is named “Right Thigh”. Take a look at it in the PWS to refresh your memory. A group named “Right Thigh” in the PWS is what we are looking to utilize. When you have switched to Modeling Mode select the group named “Right Thigh” in the PWS as see in the image on the left. You will see the CPs that make up the thigh highlight and there will be a selection box surrounding them. This is the portion of the mesh that we will be putting the thigh bone in. What we are going to do now is lock all of the geometry except for what we currently have selected in the model window. With the “Right Thigh” group still selected, click on the “Lock CPs” button on your Modeling toolbar. 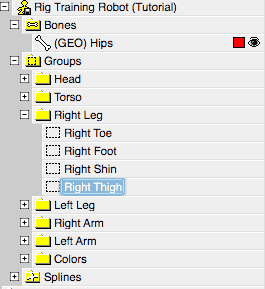 We can see here in Model Mode that the “Right Thigh” is actively selected. Now, the only part of the mesh that is editable in Modeling and Bones Mode are the CPs that make up the “Right Thigh” group. You can tell that this is the case because all of the other CPs are grayed out. They will not move if you try to move them. Now lets switch back to Bones Mode. 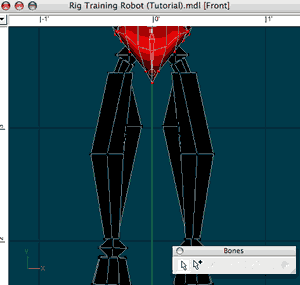 We’ve added the bone for the thigh and positioned each end a the center of the thigh’s joints. We see this here from the Front and Left views. I have pointed the bone’s roll handle to the front of the model. Now we are back in Bones mode. We can’t tell by looking at the model in Bones Mode that most of the CPs are locked. But we know, since we just locked them a moment ago. So we are going to proceed now by creating the bone that will be the right thigh bone. This will be a child of the “(GEO) Hips” bone so go ahead and select the “(GEO) Hips” and then create the new bone. Start the base of the bone at the the joint that meets the Hips then place the tip of the bone in the center of the knee joint. You can use the images on the left for reference of course. Here is what your hierarchy should look like in the PWS at this point. “(GEO) Right Thigh” is a child of “(GEO) Hips”. I’ve named this bone “(GEO) Right Thigh”. There is one other important detail that we should always be aware of when we are laying out bones. That detail is which direction that you point the bones roll handle. This is especially important when you are laying out branches of two or more bones in a chain-like manner. You should strive to have the roll handles oriented consistently along the branch when practical. For posing consistency of the bone’s rotational axis along a branch of bones such as arms, legs, tails, and spines. Certain constraints will behave predictably such as “Orient Like” and “Aim Roll At” (if you use them on the bones in question) when you observe the first reason. Whichever way you choose to point the roll handle is up to you and that will depend on your preferences as a rigger. Let’s get back to assigning the thigh’s CPs to this bone now. 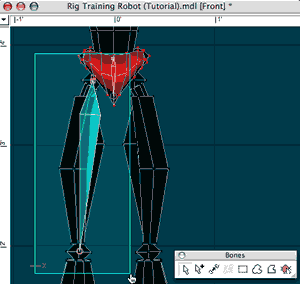 Thigh CP bounding box selection. We’ve locked all of the CPs that we do not want to assign to this bone so just do a bounding box selection with the “(GEO) Right Thigh” bone active. Make sure that your thigh bone is selected and flashing in the model window. Since all of the CPs that we do not want to deal with right now are locked we are going to select our thigh CPs with a bounding box selection. Left-Click and hold your mouse at a point relatively far away from the right thigh then drag the mouse while still holding the left mouse button to cover the entire right thigh with the selection box that appears. When you are satisfied that you have the whole thigh selected, let go of the mouse button. Now all of the mesh that was not locked will be assigned to the bone. 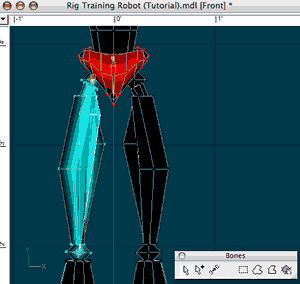 Now the geometry of the right thigh is assigned to “(GEO) Right Thigh” . Examine the mesh from different viewpoints, if you see any black spots in this area of the mesh it just means that you missed a CP(s) on the mesh. Select the area again while the “(GEO) Right Thigh” is still chosen to get whatever was missed. Now the thigh is finished.